The Cool Food School have brought fun, unique, interactive, food education to over 3,000 children since establishing in 2018. Our goal is to share the diversity and origin of foods, break down neophobia (the fear of new foods) and support parents in the daily battle to feed their children a healthy diet. We bring food education to children in a school setting, focusing on the pre-school age group but also offering programmes to primary and secondary schools. We have also brought our workshops to Taste of Dublin, Airfield Estate, WellFest, the National Botanic Gardens and more. This allows the children to use all their senses to examine the food; smell it, touch it, listen to it, look at it but without any pressure to taste it. This helps to give the children confidence around the food and this can bring them a step closer to eventually eating it! Research shows that children need to be presented with a new food anything between seven and 20 times approximately, but parents often give up after only three attempts. At The Cool Food School, we often repeat the foods we bring to class, but in new and exciting ways for the children e.g. a workshop might focus on cucumber one week and “eat your greens” involving cucumber another week. This helps with their exposure to foods which, in turn, increases the chances of them eating the food. We are delighted to be bringing our unique workshops to The Super Natural Food Market on Pearse Street again. The Super Natural Food Market, with their emphasis on real food and organic produce, are a great fit for our message of sustainability and food education. 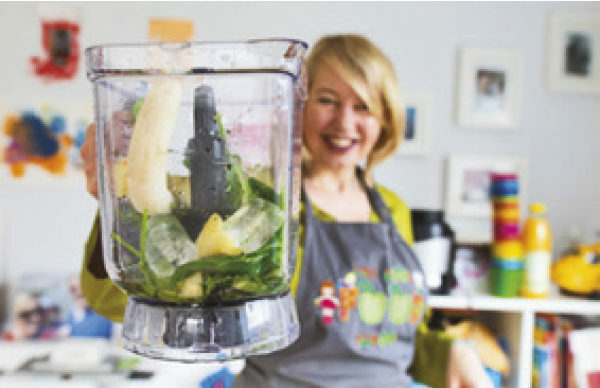 We will be offering children the opportunity to make healthy, colourful smoothies on Saturday 27th April from 1.30pm – 2.30pm. We use Kiddies Food Kutters and Safety Food Peelers which allow the children to chop and peel food safely. The Kiddies Food Kutters are used by Jamie Oliver in his “Learn Your Fruit and Veg” school programme in Australia. Our sensory workshop will encourage the children to feel, smell, listen, look at and taste the food (if they want!). It’s suitable for children from age three to seven years approximately. You can drop your children off and have a browse around the market for an hour, grab a coffee or some organic produce for dinner!